A new law enforcement practice of the Grand Chamber of the SC in environmental cases acknowledges as illegal commercial use of animals listed in the Red Data Book of Ukraine (article 19 of the Law of Ukraine of February 07, 2002 No. 3055-III “On the Red Data Book of Ukraine”) (The full text of the judgement in the Case No. 910/8122/17 is available at http://reyestr.court.gov.ua/Review/78977479. This position of the court is implied by the norms of the environmental law provided below. Use of the objects of the Red Data Book shall not be made equal to any other use of wild animals, including by way of conducting activities with animals involved. According to art. 180 of the Civil Code of Ukraine, animals listed in the Red Data Book may be the subject of the civil turnover only in cases and according to the procedure as established by the law. The objective of the law on the Red Data Book of Ukraine is to regulate social relationships in the area of the protection and management of rare and endangered species of animal and plant world listed in the Red Data Book of Ukraine in order to prevent extinction of these species and to ensure preservation of their genetical fund. According to the Law of Ukraine “On animal world”, rare and endangered in natural conditions within Ukraine species of animals are subject to special protection and are included into the Red Data Book of Ukraine. The procedure of and requirements to the protection and management of rare and endangered species of animals are established by the law on the Red Data Book of Ukraine. Article 45 of the Law of Ukraine “On animal world” determines that captive breeding of rare and endangered species of animals may be allowed only for the purpose of their preservation, protection and revival, first of all if it is impossible to achieve this in the wild, and for research and other purposes which do not result in reduction in number of these animals, but not for profit. So, operation performed by “Aquadelf” Ltd what concerns commercial use of the Red Data Book species contravenes the law and is illegal. Common dolphin Delphinus delphis Linnaeus according to the Red Data Book of Ukraine was listed in the 2nd edition of the RDBU (1994), included into the IUCN Red List (category VU), Appendix ІІ to the Bern Convention, Appendix ІІ to the Bonn Convention, Appendix ІІ to the CITES and ACCOBAMS. The book states the impossibility of reproduction and breeding of these species in specially created conditions, as they don’t become accustomed in captivity, which allows to assume that all dolphins of the dolphinarium were removed from the wild, whereas the lack of a proper dolphin registry and the simplified procedure for obtaining an animal passport makes possible to get documents for any animal as born in captivity. In addition, there may be several animals for one passport for a certain period. The Law of Ukraine “On environmental protection”, in article 64, determines that rare and endangered species of animal and plant world, permanently or temporarily being (growing) in the wild within the territory of Ukraine, its continental shelf and exclusive (maritime) economic zone, are subject to special protection and are listed in the Red Data Book of Ukraine . Protection and revival of the objects of the Red Data Book of Ukraine are provided by the governmental authorities, local self-government bodies, legal entities and natural persons who are the subjects of use of animal and plant world pursuant to the law. The objects of the Red Data Book of Ukraine may be objects of the right of state, municipal and private type of ownership pursuant to the law. Maintenance of the Red Data Book of Ukraine is relied on the central body of the executive authorities, ensuring formation of the state policy in the field of environmental protection. The Red Data Book of Ukraine is an official state document containing a list of rare and endangered species of animal and plant world within the territory of Ukraine, its continental shelf and exclusive (maritime) economic zone, as well as summarized data on the present-day condition of these species of animal and plant world and measures for their preservation and revival. The Red Data Book of Ukraine is the basis for the development and implementation of programmes (action plants) aimed at protection and revival of rare and endangered species of animal and plant world listed therein. Taking into account the above, the Grand Chamber of the SC concluded that, according to article 19 of the Law of Ukraine “On the Red Data Book of Ukraine”, special use (recovery, harvesting) of the objects of the Red Data Book of Ukraine is performed in exclusive cases only for research and selection purposes, including for reproduction, dispersal and breeding in artificially created conditions, as well as for revival of populations based on a permit of the central body of the executive authorities implementing the state policy in the field of environmental protection, pursuant to the decisions of the National Commission for the Red Data Book of Ukraine as adopted according to its powers. 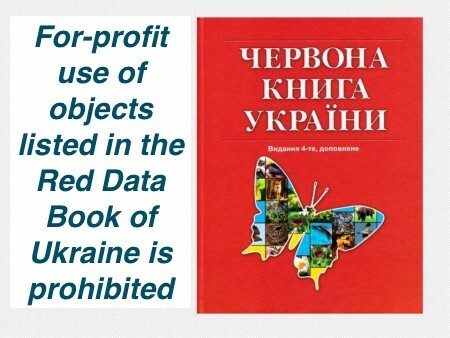 Special use (recovery, harvesting) of the objects of the Red Data Book of Ukraine for profit is prohibited. So, the Grand Chamber of the SC marked a decisive end to the discussion whether commercial use of the Ukraine’s Red Data Book objects is allowed, having determined that such commercial use contradicted the law and should be ceased. We hope the judgement of the Grand Chamber of the SC will pave the way for ceasing illegal operation with the Red Data Book objects within Ukraine.